Please note, these are just personal opinions. Also note, I like smartphones. I like phones that allow me to communicate, and I love text messaging and push email. My phone is a communication device for me, but I like having a bit of media handy for when I’m killing time. My favorite network, even though I know it is considered the red-headed stepchild of the industry. Great data service, maybe even the best. It also is tied with Verizon Wireless for the best on the west coast. It also has the cheapest plans, if you want unlimited data and text (which I do). It helps that I get a great corporate discount. For Sprint, there is no contest. I don’t think there is any second place phones that close. Plenty of reviews online, although I think Precentral and Engadget have the best. Of note, Sprint doesn’t have a very good Blackberry lineup as of now (Curve is really old), and they are saddled with a whole bunch of Windows Mobile phones that are really not worth dealing with. Probably overall, the strongest all around network in the US. Verizon Wireless had the best network in New York by a large margin when I was last there (2 years ago), but it hadn’t changed in the 10 years I was there. They tend to cripple their phones though. I’m gonna cheat a little here. I wouldn’t actually get ANY Verizon phone right now, I would wait. Of the flagship phones, the Storm is really a dud, in my opinion. The Blackberry Tour is supposed to be coming out within the next couple months, so if you can wait I’d go with that. Great messaging and email, beautiful screen, great size. Also as a plus, it is supposed to have a GSM chip so you can roam most of the rest of the world. If you can’t wait… well, not sure why you can’t wait, but I guess you can get the Touch Pro, if you like hacking the phone, if you like resetting and rebooting to get it work, if you like losing a call randomly due to a phone crash. Or in other words, don’t. Click on the pick for a very nicely done review from Crackberry.com. The forgotten network. Consistently gets great customer satisfaction reviews for it’s size, even though it probably has the smallest 3G network, and network overall. But hey, they have Catherine Zeta-Jones. That’s gotta count for something. (Back in school, I still remember when a friend a mine said that they personally blame CZJ for overloading T-mobile’s network). 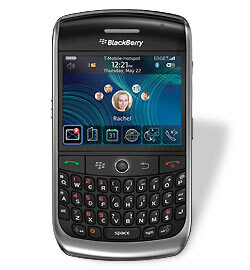 The Blackberry Curve 8900. Great email, great messaging. Good size, pretty good browser. Most of the important apps are available. No 3G, unfortunately, but you’re not gonna have a lot of 3G on T-Mobile anyway. Definitely get Opera Mini if you are using a blackberry, especially since you are used the narrow EDGE network. If your life is on Google anyway (gmail, calendar, etc), you could seriously consider the G1. It’s a little ugly, and it’w already over 6 months old. You can also wait, since a lot of phones are supposed to come out on the Android OS in the 2nd half of 2009. Side-sliding keyboards are also a pain. Everyone I know who has one wants a virtual keyboard as well, which is telling. Unfortunately, AT&T is a victim of its own success. It didn’t have a very good data network to begin with, and a certain fruit phone has completely choked the network. What did you expect? If you are going to deal with AT&T you might as well the phone that causes most of the problems. Really, if you want a Blackberry or a Pre, there are better networks to go to. If you are on AT&T you are doing it for the iPhone. The network really hurts though, you should see how much faster the maps load on my Palm Pre compared the iPhone 3G. I don’t expect the iPhone 3GS (what’s this, are these Acuras Integras?) to be all that much faster. The problem isn’t the speed of the chip, it is the congestion. That said, the iPhone has the best virtual keyboard around, but everyone who owns an iPhone seems to text and email on their phones less than I do. That’s telling to me. By the way, it is really too bad about the network. AT&T also has a very nice Blackberry Bold, which spacious keyboard. Although it is a bit big and bulky for some people. If you are going to be on AT&T, I would definitely choose a Blackberry though. Blackberries don’t seem to need a broadband nearly as much to be effective. So you have it, my totally biased opinion. Well, we’re all a little bit biased, as they say. For many years, many people (me included), believed that modern cell phones do not produce enough radiation to significantly affect modern medical equipment. Most of the studies were old, and modern medical equipment and modern cell phones are very different today. Well, some folks over in Amsterdam managed to properly study this and found that cell phones actually do affect medical equipment. The article was announced a few days ago and published on the website at Critical Care. Before everyone goes into a panic, it’s worth saying a few things. First, the interference occurred when the mobile device was within a median distance of 3 cm from the device. However, hazardous interference occurred as far as 3 meters away, so it would seem fair to say that cell phones should be kept out of critical care units and operating rooms. It is, however, probably still unreasonable to ban these phones from the entire building. Another article from the New York Times. A product sold by Neurometrix, called NC-stat, is the topic of an article today’s New York Times, in particular the way it shows the problems with how doctors are reimbursed for the care that they provide. Also provided here, is a link from Medgadget, and their review of how the NC-stat device works. For physicians, who might be able to bill only $80 or so for a routine 30-minute office visit, Neurometrix’s promise of a profit as high as $250 for 15 minutes, is compelling. So was a customer-referral program in which physicians could receive hundreds of dollars in free products for steering other doctors to Neurometrix. For some health policy analysts, the popularity of such procedures illustrates why primary care doctors should be paid more for basic office visits and less for money-making procedures. Earning $250 from a diagnostic test “is obviously out of line with what physicians can earn from office visits,” said Paul Ginsburg, the president of the Center for Studying Health System Change, a Washington research group. The reality is that doctors are simply not paid very much for spending time with patients, particularly in comparison to doing some fancy procedure. The Medicare payments system that prices things based on the amount of resources it uses encourages people to use resources. It seems obvious, but if one creates an incentive, one shouldn’t be surprised if people take it. In this case, one shouldn’t be surprised if the entire medical industry is geared toward using more resources. In fact, the expert doctor who can accurately diagnose people quickly is actually paid less, because, well, they’re too fast. Anyway, the complete article is below.